For many years after the magazine's demise, editor Leo Margulies owned the Weird Tales property and drew a number of anthologies and reprints from its yellowing pages. The Ghoul Keepers was one. Originally published in 1961, the book was reprinted in 1965 in the version shown here. Margulies introduced the book, but not with the scholarly approach used by Sam Moskowitz in other collections of weird tales. The cover blurb promises a panoply of supernatural creatures: "Monster, Vampire, Demon, Sorcerer, Ghost, Witch." For the more discriminating reader, it also offers a partial list of authors. Every one of the stories in The Ghoul Keepers was originally printed in Weird Tales. Six out of nine are from the Dorothy McIlwraith years (1940-1954). Some trivia: Seabury Quinn, author of "Claire de Lune," was the most prolific of all contributors to Weird Tales. Between 1923 and 1952, "The Unique Magazine" printed over 150 of his tales. Weird Tales writer Helen W. Kasson was the sister of pioneering science fictioneer Stanley G. Weinbaum. "Spawn of Dagon," starring Elak of Atlantis, is Henry Kuttner's hybrid of heroic fantasy in the mode of Robert E. Howard and H.P. Lovecraft's "Cthulhu Mythos." The story was published in 1938 shortly after the deaths of those two giants of Weird Tales. 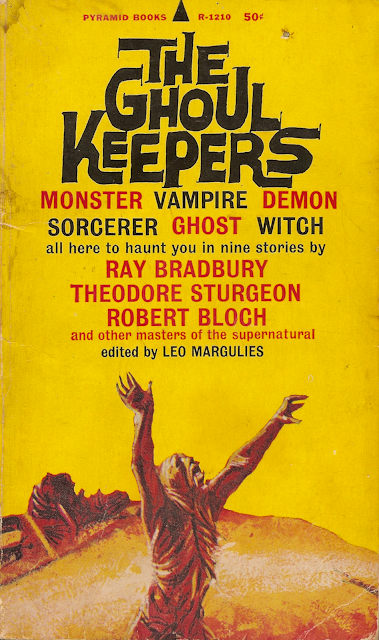 The Ghoul Keepers, edited by Leo Margulies and featuring nine stories from the pages of Weird Tales. The cover art is by the renowned science fiction illustrator John Schoenherr (1935-2010).